The other morning I thought I'd whip up a little, fun, finger-food for breakfast. We just bought some bananas at the store and since my son loves them, I thought I'd pair it with peanut butter (which he also absolutely loves) and a tortilla. I'm calling them Peanut Butter Banana Bites because, well, there really isn't a better name for them. 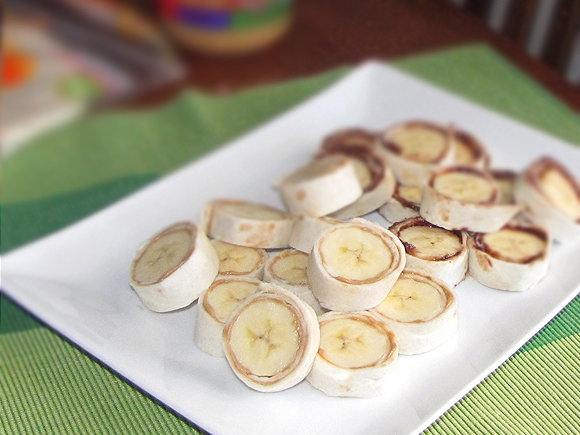 All you do is simply spread the tortilla with a little peanut butter, place the banana on top, roll it up and slice it into bite-size pieces. I also did one with chocolate hazelnut spread for a little variation. Sounds like perfect kid food, right? Well, he wouldn't even touch it! He actually screamed "No!" and ran away at one point. I just didn't get it. They looked good and they tasted good so what was the problem? After a few minutes of coaxing, he finally ate one and loved it. Well, that's what he told me anyways because after that first one, he wouldn't have another. My husband loved it. I loved it. My son said he loved it. He either lied and really didn't or he did but would rather play with his trains than eat. I think he secretly liked it but just couldn't stand to be away from those trains for one more minute. Either way, it's the perfect little bite and any kid would love them as a fun breakfast or a snack. 1. Spread tortilla with peanut butter. 2. Place peeled banana at one end of the tortilla and roll it up to the other side. 3. Slice into 1/2" - 3/4" pieces.